Last Friday night, Benzo and I drove out to Lawrence, KS for the evening. While we were out there I suggested we eat dinner at this place called Local Burger. I had heard about it before and checked out their website and knew it was a place I had to try. …to serve delicious food at a fair price with impeccable service while creating a culture of passion for knowing where our food comes from and how it connects us to our world, to our communities, and to ourselves. As I read through the website prior to last Friday, I learned that Local Burger supports local farmers, hence the name Local Burger. Underneath most items on the menu, you’ll find the name of the farm and town where it came from. Even the tofu! Local Burger also has a very diverse menu, with lots of vegetarian, vegan and gluten-free options. All their meat comes from sustainable farms that use humane practices and do not use antibiotics or hormones. I immediately knew that this place was right up my alley because they share all my values! On Friday night, with directions in hand, we ventured out to Lawrence. To be honest, I always get a little apprehensive when going to a new restaurant. I suppose I’m afraid of doing the wrong thing because I don’t know the routine. Like getting in the wrong line or going in the wrong door or not saying the right thing. It’s silly I know. I also take forever to decide what I want to eat at new places, so I usually try to do some research ahead of time so I have a couple options in mind by the time I get there. We found the restaurant easily. It’s in downtown Lawrence on Vermont street between 7th and 8th. We only had to park about a block away luckily. Local Burger has a counter where you order and then they bring it out to your table. While you wait there are brochures on the tables that tell you about the local farms from which they source their ingredients. They even list how many miles away from the restaurant they are. Some were only 2 miles away! Benzo had an Elk burger with fries (no picture). Our bill was a little less than $20. So how was it? I thought it was really, really good. Both our burgers came out on wheat buns with lettuce, tomato, pickle and onion. There was ketchup and mustard on the table, which I added. 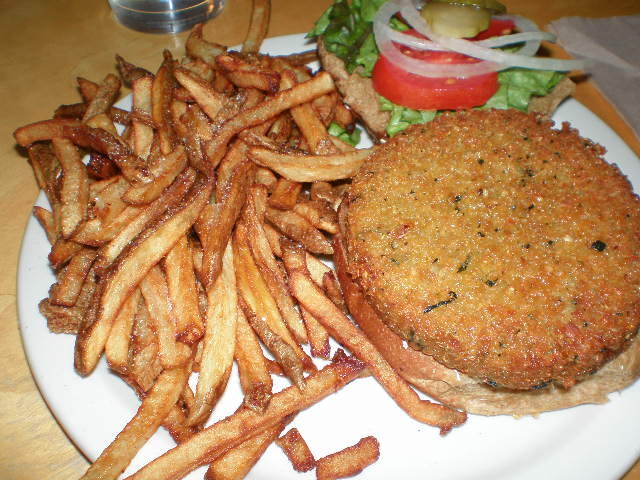 As you can see in the picture the veggie burger was crispy-fried on the outside, however it was a bit mushy on the inside. When I bit down on the burger, the veggie patty would mush out a little bit. That’s my only complaint. I wish the veggie burger would’ve held up a little better. The flavor though was great! The fries were made of organic potatoes and were fantastic. Benzo said they were the fourth best fries he’s ever had (after Oklahoma Joe’s, In and Out Burger, and sweet potato fries at Lucky Brewgrill). He also went gaga over the organic ketchup on the table. I told him I’m pretty sure I had seen that brand at Walmart before and we could buy it if he wants. We will DEFINITELY eat here again. I thought the price was great, especially considering the quality of the ingredients. I also don’t mind paying a little extra to support local farmers. I really like that they offer a diverse menu so that people with special dietary needs have lots of options. They had a ton of other menu items that I would like to try like the tofu fillet, roasted vegetable salad, TLT salad, and the quinoa-millet pilaf. Another interesting thing about Local Burger – no pop fountain. At all. The drinks they offer are all natural pop sweetened with juice or stevia, as well as organic iced tea, coffee, assorted regional beer and organic wine. I don’t drink a lot of pop so I didn’t miss the fountain at all. Bottom line: two thumbs up! If you are in the KC area, you should drive out to Lawrence and check this place out! I know that there are a lot of readers who are in the KC area, so that’s why I like to highlight local business. Especially ones like Local Burger that have great values. If you do not live anywhere near KC I hope this inspires you to seek out similar places in your area!